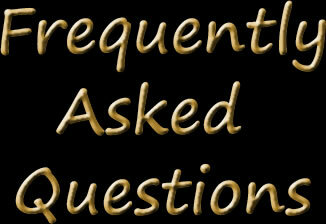 Some common questions are answered for you below. HOW DO I KNOW IF MY PET NEEDS A CART? 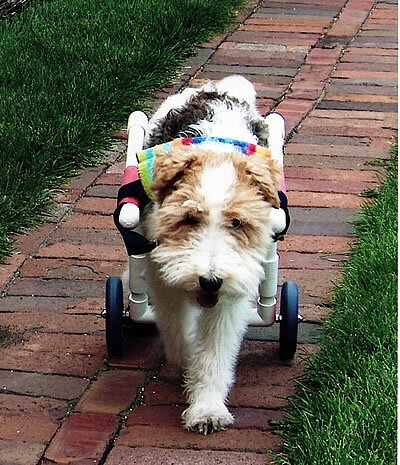 If your pet is recently paralyzed or is having trouble getting around without assistance, then a cart will provide much needed exercise. 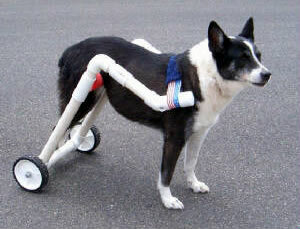 Your veterinarian may recommend that you get a cart to help with mobility issues. 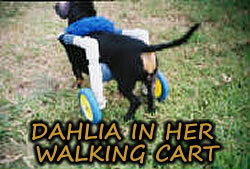 We make carts for all types of mobility issues from hip dysplasia to ruptured discs. I must stress that you do not want to put your pet into a cart too soon following a disc rupture or other similar injury. We recommend a 4-6 week rest and recovery period before beginning cart use. This time allows the traumatized tissues to begin healing. Your veterinarian may have other specific guidelines that they follow, so be sure you check with your pet’s doctor before using a cart for your pet. Mabel in our large dog model. AM I DOING THE RIGHT THING FOR MY PET? I wanted to include this answer because so many people ask me this question. These wonderful creatures do not see this disability as we do. They never feel sorry for their circumstances, they just want to be back to normal again. A cart gives them that opportunity to become new and whole again. 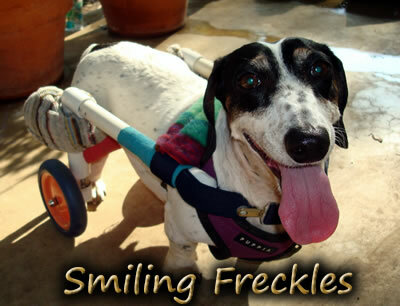 You will actually see your pet “smile” when they take those first few new steps in a cart. They instinctively know it is there to help them. They quickly learn to adapt and before you know it, they are off doing what comes naturally, just being themselves. The cart has become a part of them. Don’t be swayed by nay-sayers who are negative about what you are doing for your pet. You know that animal better than anyone and you know they want to live and be happy again. He can play with his Toys again. CAN MY PET USE THE BATHROOM WHILE IN THE CART? Yes, with practice, your pet will be fully capable of urinating and defecating while in the cart. Some pets will take time to get used to the feeling of eliminating while in the cart, but most will catch on in a few sessions. However, while your pet is in the process of learning this new technique, we do recommend that you make sure they are eliminating sufficiently by taking them out of the cart to eliminate if they have not gone within a reasonable amount of time. We find it is helpful to take them out to the same spot in the yard each time so they learn to associate the trip with elimination. Using their “favorite” area helps by stimulating their sense of smell. CARTS IN GENERAL SEEM SO HEAVY, WILL YOUR CART HURT MY DOG’S BACK? The Dogs to Go carts are very lightweight. They are made of PVC pipe, which makes them very durable and light. No heavy metal or bulky harnesses on any of our carts. The cart is actually designed very carefully, despite its simple appearance. We designed it so that it places the pet’s spine in a traction position, making it very healthy for continued healing to take place. All of the support devices are padded. We use a solid support bar under the abdomen. This bar is heavily padded and is designed with a channel down the middle to relieve pressure on the urethra. Our support strap across the shoulders is also padded and is actually made of elastic so it gives with each step your pet takes. This helps to distribute the weight of the cart evenly. It will not cause pressure sores like solid shoulder pads can. The nature of a cart is to redistribute the pet’s weight to the front, taking weight off of the rear quarters. In this, there will be some weight placed on your pet’s shoulder area. But, we design our shoulder pad to sit directly over your pet’s center of balance. This is the area of the spine which can handle the greatest amount of load bearing. (Not unlike how a saddle fits a horse’s back.) The saddle sits over the center of balance also, making the horse able to carry large loads with little or no stress. Maybe all these years of having horses helped us just a little bit in the design process too! These carts are balanced. Your pet will tell you this when you place it on them. If all the adjustments are correct, you will see your pet take off! It just feels right to them. DOES MY PET NEED A WALKING CART OR A FULL SUSPENSION MODEL? A walking model allows the pet to put his feet down on the ground and use them to walk. The cart acts as a support for the rear end weight. This is especially helpful in cases of rear limb weakness. They work very well for dysplastic dogs, dogs with Degenerative Myelopathy and those dogs with IVDD who are just starting to walk again. We DO NOT recommend a walking model if your pet is knuckling his feet or crossing his rear legs. 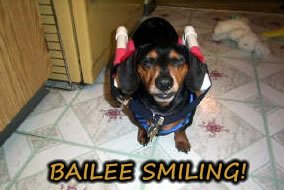 Also not recommended for dogs who are not yet making the “walking” motions with the rear legs. These cases will get friction sores from dragging and will do much better if started off in a full suspension model. Both of our cart models can be easily converted to the other when needed. She is recovering from IVDD. HOW LONG CAN I LEAVE MY PET IN THE CART? When you receive your cart, we recommend starting out the first two weeks with short sessions of 15-20 minutes with rest periods in between. Even though your pet may not seem tired, he will be. This is a LOT of aerobic work. It is especially important for older pets to start out this way. They need time to adjust and build up some endurance, both respiratory and cardiac. Their muscles need time to build also. You can greatly speed up the adjustment time by sling walking your pet until your cart arrives. This will help them get the feel for the cart as well as building strength and endurance. Once your pet is used to the added exercise, you may leave them in the cart for longer periods. If you see them attempting to lay down, that generally means it is time for a rest. Pets who have been in carts for a long time can go for several hours. Our own dog, Mary our Schnauzer has now been in hers for over 7 years (2008) and she frequently spends half the day in her cart. No problem. WE NEVER RECOMMEND LEAVING YOUR PET IN THE CART UNATTENDED. SUPERVISION IS NEEDED NO MATTER HOW LONG THEY HAVE BEEN USING A CART. WILL USING A CART SLOW MY PET’S RECOVERY PROCESS DOWN BY MAKING HIM LAZY? In my many years of working with these pets and building carts, I have NEVER found this to be true. If a pet is going to recover, it will do that no matter what! Carts do not hinder the progress, they actually help to speed it up by providing great aerobic exercise which stimulates circulation. We do recommend that you continue your physical therapy exercises even after you receive the cart. These exercises will also help to stimulate circulation and help aid in recovery. Our carts are each custom fitted using your pet’s measurements. This allows us to fit quite a variety of body types. As you can see, we make carts for cats, little dogs, big dogs and even some exotic pets like rabbits and skunks. 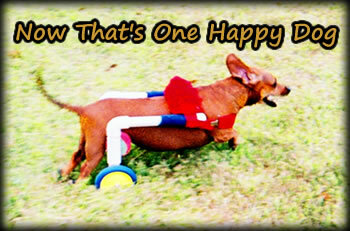 We can make a cart that is right for your pet’s particular needs. If you need something special, just ask us. 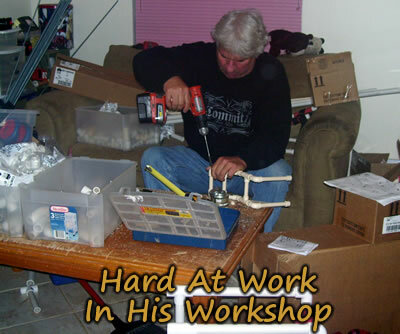 We are also capable of making special adjustments for special needs. ISN’T IT TRUE YOU GET WHAT YOU PAY FOR? My Momma always said that, and in most cases I have found it to ring true. However, in the case of Dogs to Go carts, it is simply NOT TRUE! Our carts may be less expensive than other carts on the market (A LOT LESS), but the reason is simple. There are a lot of people out there (including ourselves not so long ago) who just cannot afford to buy an expensive cart for their pet. So, because of these financial restraints, they are not able to get what they need to help their pet. THAT NEEDS TO CHANGE! Our carts are backed by two things I think are most important. Maybelline napping in her cart. And, second, you get a cart that has been tested on many patients at that clinic, all under the supervision of three board certified surgeons. Dogs to Go currently (2008) has over 600 happy pets using our cart on a daily basis for over 5 years, some even longer. And, many, many more all over the world who have just begun using their new carts. We stand behind every cart we build. We gladly repair or replace any part of the cart that becomes damaged. It takes a lot to wreck them, but if your pet does, we fix it for only the cost of shipping. Our most common repair is wheel replacement. 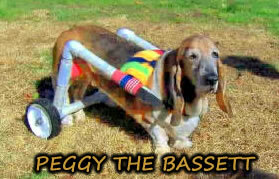 Pets using them for such a long time naturally just wear the wheels out! We replace them for free. HOW DO I KNOW MY PET WILL ACTUALLY USE THE CART? Most pets that are disabled want to be mobile again. However, some pets will not readily use a cart in the beginning. There can be a couple of reasons for this. Some pets are simply not strong enough in the front quarters to use a cart. You can test their front end strength by sling walking them around the yard. 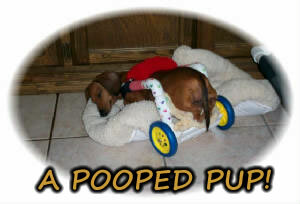 If your pet tires quickly, then he or she may not be strong enough to use a cart. This is especially important in older pets. They often have arthritic or neurological changes in the front end that will make them weak. Some pets may be timid, making them fearful of the cart. These pets can be desensitized by leaving the cart in plain sight where they spend the majority of their time. Bed, food bowl, etc. For these pets, I like to go very slowly. Don’t ask too much too fast. Let them get used to the idea before asking them to actually use it. Try it on, take it off. Praise, repeat. When walking these pets for the first few times, we recommend using a leash to help steady them and keep their speed controlled. There are no rules for how long it may take. Lots of praise and goodies can make this a pleasant experience for the timid ones. MY PET IS STARTING TO WALK, WILL THE CART STILL BE USEFUL? Yes, depending on the degree of function your pet has regained, the walking version of our cart can really help speed up the walking process. 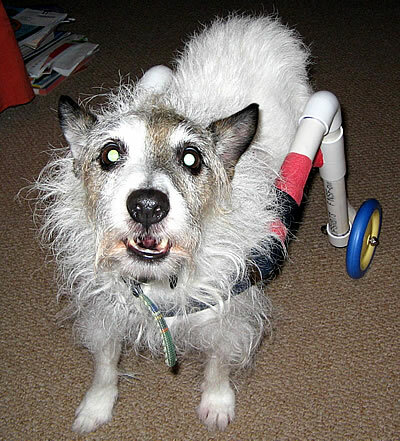 If your pet is to the point where it is moving it’s legs in the walking motion and can stand unassisted for short periods, then it is time to put the walking wheel set up on your cart. 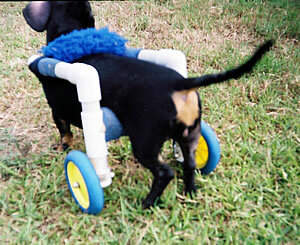 The walking set up allows those rear feet to touch the ground so your pet can quickly relearn the walking process. The cart helps their brain relearn faster because it no longer needs to focus on balance. The cart supports the pet and the brain recognizes that your pet will not fall, so it shifts it’s focus to coordination. We commonly switch out the wheel assembly from full suspension to fit the progression of the walking movements. It is easy with our cart to switch back and forth between walking and full suspension set ups during the rehab process.